Kilsheelan Scout Group was one of the local organisations to win a trip with Irish Rail in 2015. YOUR ATTENTION PLEASE, ladies and gentlemen. We have a very special announcement this morning. 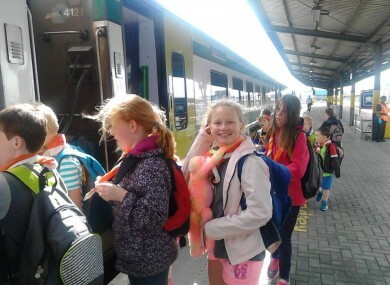 TheJournal.ie is delighted to partner with Irish Rail to offer 100 free trips to groups who are doing fantastic work in communities right across the country. Journeys with TheJournal.ie is an initiative that seeks to support organisations in the voluntary, community, sporting and charity sector by bringing them where they need to go over the coming year. Irish Rail will provide 100 groups with a free group travel return journey for up to 50 people per group. That is FIVE THOUSAND free train trips across any of Irish Rail’s services. This could bring your local club, group or organisation to that special event you would love to attend, on a well-deserved outing, or even be used as a specific support to members of the group who need help to travel to a destination. How do I apply for my group to win a free trip? This is the fifth year of Irish Rail’s free trip initiative and this year, the company has partnered with us here at TheJournal.ie so that we can spread the word about this project. We hope that you, our loyal and engaged users, can help us share news of the initiative with friends, family, colleagues and local groups who you think would really benefit. We are using the hashtag #JournalJourneys to get the word out on Twitter and Facebook, so feel free to add that if you are giving a shout-out to a group you think should apply. Entry forms are also available at all Iarnród Éireann stations and can be posted to Corporate Communications, Iarnród Éireann, Connolly Station, Dublin 1. The closing date for receipt of entries is Friday, October 21, 2016. There were over 900 entries for the scheme last year so get your application in early! Last year, winners ranged from Special Olympics team groups to Girl Guides, active retirement clubs to choirs and Men’s Sheds groups. All applications received by October 21 will be considered by a judging panel and successful groups will be notified from November 11 onwards. We will give a little taster of early winners here at TheJournal.ie by revealing one winner a week during the application period, so stay tuned each week for that. You can read about the experiences of some of the 2015 winners on the site here tonight to give you a sense of how much enjoyment and benefit they reaped from last year’s scheme. Email “WIN: Free trips for 100 groups with TheJournal.ie and Irish Rail”. Feedback on “WIN: Free trips for 100 groups with TheJournal.ie and Irish Rail”.